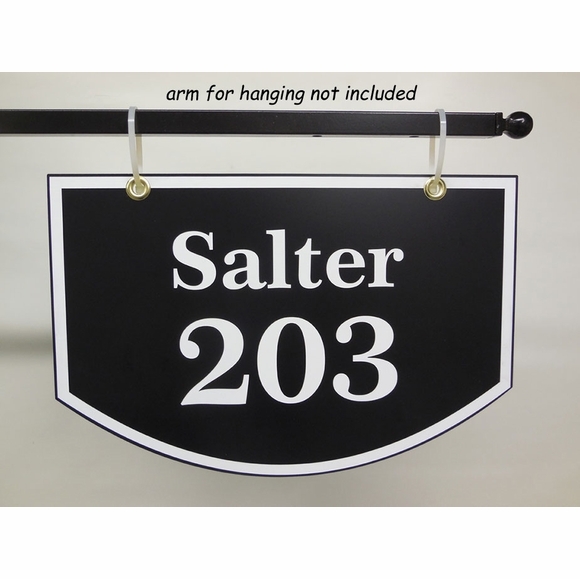 Personalized Arch 2 Sided Hanging Address Sign - - Double-sided 16"W x 10.5"H personalized upside-down arch plaque with two lines for your address. Made in USA. Two side hanging sign. Same personalization appears on both sides. Made from sturdy, UV-stabilized non rusting laminated acrylic with engraved personalization. Line 1 holds up to ten (10) 2-inch characters. Line 2 holds up to five (5) 3-inch characters. If ordering just 1 line with a number, the character size and position will be adjusted accordingly. Dimensions: 16"W x 10.5"H x 1/8". Colors: sky blue with white characters, black with white characters, or white with black characters. Thin white or black stripe around the perimeter highlights the upside down arch shape. Stainless steel S Hook #P2452 and Quick Link #P2478 are available to make your installation job easier.